Actor Ryan Gosling teams up again with the director of La La Land for a riveting film adaptation of the biography about Neil Armstrong written by James R. Hansen. First Man is the biographical story of astronaut Neil Armstrong(Ryan Gosling)as a test pilot and astronaut in the years preceding the Apollo 11 mission and culminating in his historical role as first man on the moon on July 21, 1969. Armstrong was a family man, and the film highlights the emotional difficulties of a test pilot and astronaut family in a career with a high mortality rate. Janet Armstrong(Claire Foy) is supportive but also resentful of the toll that Neil’s career has on the family in his absences and in the concerns about his safety. The screen story highlights the irony in the fact that the pinnacle of human technology allowed Neil Armstrong to walk on the moon but that same technology was inadequate to save the life of his two-year-old daughter, Karen, who passed away in her childhood from cancer in the decade preceding the lunar landing. At one point in the film, Armstrong is asked by a NASA committee whether he was affected by the death of his daughter. Armstrong’s response was effectively that it would be disingenuous to pretend that it would not have some effect on him. The screen story wisely refrains from attempting to explain that effect, leaving it instead to the viewer to gauge the effect of that tragedy on the astronaut. Gosling and Foy are joined by an excellent cast which includes Cory Stoll(Buz Aldrin), Kyle Chander(Gene Slayton), Jason Clarke(Ed White), Pablo Schreiber(James Lovell), and Shea Whigham(Gus Grissom). First Man inevitably has some of The Right Stuff(1983) in its DNA given the common subject matter and cast of characters in both films. First Man is ultimately the story of Neil Armstrong, not the space race, and most of the story is told through his eyes and perceptions. Screenwriter Josh Singer(The Post) adapted the screenplay from the book FIrst Man: The Life of Neil A. Armstrong written by James. R. Hansen. Hansen is a producer of the film along with Steven Spielberg. Director Damien Chazelle(Whiplash) expertly stages the flight sequences and the cinematography by Linus Sandgren(La La Land) propels the story in the film that feels shorter than its nearly 2 and 1/2 running length. The film was created on 16mm and 35mm film as well as with IMAX cameras. Most of the film was made in 35mm with 16mm reserved for cockpit sequences to create a gritty feel and with the aspect ratio opening up with the space sequences filmed in exquisite clarity on IMAX film. The film score by Justin Hurwitz(Whiplash, La La Land) deserves mention in its strident urgency in building drama and suspense, even when we know the outcome already from history books. The flight sequences are riveting with the combination of camera view, sound effects, music score, and acting by the principal actors. Gosling and Foy inhabit their roles in bravura performances that deceive the audience into believing that history is being witnessed. Neil Armstrong remains something of a cipher, ultimately, since the film covers only a small portion of his adult life. The mystery of the man is like the mystery of the cosmos and the exploration of our microcosmic corner of the universe. First Man may not provide all of the answers but it invites the viewer to ask the significant questions about our mortality and the importance of scientific development in exploring and understanding our role in the universe. First Man appears on 4K UHD disc in its original 2.39:1 screen aspect ratio, with the IMAX sequences opened up to 1.78:1. Video quality is superb, even in the sequences shot on 16mm film, which show some grain, unlike the remainder of the film. The IMAX footage on 4K UHD demonstrates clarity and fine detail like nothing else. The contrast between light and shades of hue in the lunar landing sequence highlights the verisimilitude of the wondrous visual effects. This is a flawless video presentation on 4K and definitely worth the upgrade from Blu-ray. The English Dolby Atmos audio combines with the excellent video presentation to deliver a full sensory experience. Directional audio is not so much discreet to each speaker as it is ethereal, with the audio mix giving the illusion of sounds from all planes of axis. The punch of audio in certain of the flight sequences is so pronounced as to be terrifying, and immerses the viewer in the stomach churning vertigo that the pilots must have experienced. The Apollo 11 launch sequence particularly creates a wall of sound so awesome that one almost wonders if the rocket stages are proceeding according to plan or about to explode the mission into oblivion. Even though the historical outcome should never be in doubt, the rich audio conveys the rocket launch in such an illusion of reality that may never have been recreated so well before on film. Deleted Scenes(4:17): “House Fire” and “Apollo 8 Launch” playable individually or with a “Play All” function. Shooting for the Moon(3:40): Director Damien Chazelle talks about his discovery of the book First Man: The Life of Neil A. Armstrong written by James. R. Hansen and bringing screenwriter Josh Singer on board for the film adaptation. Preparing to Launch(3:39): Cast and crew talk about the enigmatic nature of Neil Armstrong. GIant Leap in One Small Step(4:31): Sons Rick and Mark Armstrong join the cast and crew in talking about the heroic nature of Neil Armstrong accompanied by archival footage and vignettes from the film. Mission Gone Wrong(2:42): Stunt coordinator Jim Churchman talks about some of Armstrong’s close calls as a test pilot recreated for the film. Putting You In The Seat(7:09): Damien Chazelle and Ryan Gosling talk about their efforts to convey on film the experience of launching into space. Recreating the Moon Landing(6:01): Chazelle, Gosling, and Cory Stoll talk about recreating the historic moments for the film. Shooting at NASA(3:11): Cast and crew talk about shooting on location(on Earth). Astronaut Training(4:02): Actors cast as astronauts visit NASA to immerse themselves in details from the period. Feature length commentary: Director Damien Chazelle, screenwriter Josh Singer, and film editor Tom Cross provide an optional commentary. Also included is a paper insert with validation code for digital download of the film via the “Movies Anywhere” app. First Man is a first rate account of the space race through the eyes of the first man on the moon. Although the film glosses over the highlights of Neil Armstrong’s career leading up to the Apollo 11 moon landing in favor of spending a good portion of the film on that historic event, First Man is not so much a comprehensive biography as a snapshot of the years immediately leading up to the first lunar landing. The video and audio presentation on 4K UHD are definitely worth the price of admission, and the upgrade from Blu-ray, and the special features are worthwhile viewing rather than dispensable filler. First Man is recommended to anyone interested in seeing a microcosm of the space race of the 1960s through the eyes of the man who lived those events. I thought this movie looked soft with a 2k scan. The grain is also soft, which make encoding the movie difficult. This causes grain to crawl with moving images, panning images. There are a couple instances of edge enhancement and halo-ing also. This movie has a great stylized look, but that look cannot be achieved by Universal. I'm actually still waiting for Universal to make a great looking 4k disc, and this isn't it. This movie doesn't look good in my opinion. Thanks for the review, Timothy. I didn't catch 'First Man' in the theater so I'm going to do a blind buy on the 4K Blu-ray. I'm sure I'll be happy with the presentation after reading your review and the one at another site. You’re right Carlos, I just watched this last night and felt that while the movie was done extremely well I was left feeling the audio track was underwhelming. Where was the low end on this movie? I just set up a new SVS SB 3000 subwoofer on my system last week that has left me impressed but I was wondering if the sub was even getting much action during this movie. Terrific movie but felt the presentation could have been a bit better. So much for spending extra money on decent hardware when the studios continue to release discs that fail to full utilize the hardware we buy. 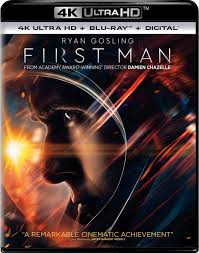 First Man on 4K UHD is available on disc at retail beginning today, after having been available for the last 2 weeks via streaming and digital download. The film received Academy Award nominations this morning for visual effects, sound mixing, and sound editing. Yeah, I got my 4K/UHD disc on yesterday so I'm looking forward to watching this film again in my own HT environment. Ditto. I was disappointed when I saw it in theaters due to perhaps my high expectations. Watched it yesterday. It looked terrific with my Sony XBRX940E/Panasonic UB9000 combo. I had no complaints about the LFE, I totally felt the Saturn rocket launch in my chest. I felt the film was a bit slow a times, but I still thoroughly enjoyed it. I give it 4.5 out of 5 stars. We'll be showing it in the Booth Bijou Garage Theater in the near future. I watched this last night and felt that it added a few things to the 'space film' canon – particularly the visceral and claustrophobic moments in the various cockpits and capsules. I'm just not sure of Ryan Gosling as an actor – he is such a blank canvas to me (how 'samey' is this role to the role of 'K' in 'Blade Runner 2049'…?) – although I know the character he plays here is meant to be very 'closed off'. In the extras, someone said 'no-one has done this story before' – not quite true – I felt the story was well covered in 'The earth to the moon' HBO series…..
One to watch (and think about) again I think….